The Vice President of India, M. Venkaiah Naidu has called the eminent Agricultural Scientist, Prof. M.S. Swaminathan is a Vishwa Guru in Agriculture, a teacher and a scholar who continues to leave his inspirational, ideational thought prints on the world. He was addressing the gathering after presenting the first World Agriculture Prize to Prof. M.S. Swaminathan, instituted by the Indian Council of Food and Agriculture, here today.The Vice President said that Prof. Swaminathan ushered in green revolution and laid a firm foundation for India’s food security. 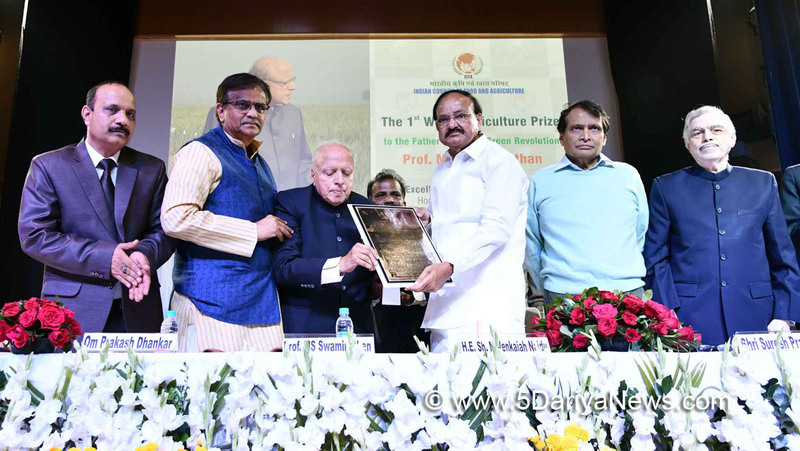 His vision and lucidity of expression have captivated more than a whole generation of agricultural scientists, he said.The Vice President called up on the policy makers to accord highest priority to agriculture as it provides employment to more than 50% of the population. He urged them to have positive bias towards agriculture and rural areas while allocating resources.We need to accord the most favoured status for agriculture to give impetus to the farmers and provide infrastructure, irrigation, investment, insurance and credit, the Vice President said.Stressing the need to re-think the development paradigm and see how we can make agriculture more economically viable and attractive, Shri Naidu called for regular and effective coordination between scientists, policy makers and farmers to make it sustainable. Concerned over the decrease in number of people engaged in agriculture, the Vice President called for concerted, coordinated action to address a number of issues that impact the growth of agriculture sector and the quality of life of people who depend primarily on this sector. Talking on the ill effects of climate Change, Shri Naidu said that it is impacting every aspect of life including agriculture and said asked scientists and policy makers to evolve strategies to cope with the changing climate, depleting resource base and increasing food demand.“This calls for policy changes in agriculture sector. We should focus on developing climate resilient crops. We need to develop crops that can withstand extreme weather conditions,” he said.The Vice President said that hidden hunger and nutritional deficiencies are major challenges before the world. He said that nothing short of an agricultural renaissance and an evergreen revolution with nutrition as the main component can make us realize this ambitious goal.The World Agriculture Prize has been instituted by Indian Council of Food and Agriculture to recognise the contribution of eminent people who served the mankind though agriculture and allied services.The Minister for Commerce and Industry, Shri Suresh Prabhu, the Governor of Kerala, Justice P. Sathasivam, the Minister for Agriculture, Haryana, Shri Om Prakash Dhankar and representatives of Indian Council of Agriculture and Research & Indian Council of Food and Agriculture and more than 200 farmers were present on this occasion.